Melaka city and George Town, Penang were both important trading ports as far back as the 1500s. Many Chinese migrated there to make their fortune and start a better life. Some married native Malays and over time the fusion of the two cultures led to the evolution of their own traditions and identities known as Perenakan or Baba Nyonya, adding yet more diversity and richness to the Malaysian cultural melting pot. These ports were later colonised by Europeans, who brought Indian workers with them who also settled there. 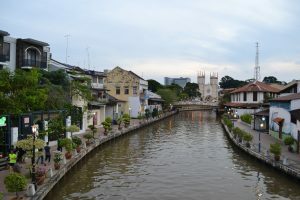 Both cities were designated UNESCO world heritage sites in 2008, not only to protect the architecture – traditional Chinese shophouses, fortification ruins and grand colonial buildings – but also to recognise the unique blend of cultures that converge there. The 2hr train to Melaka was fast, affordable, clean and comfortable. Travelling by train is a great way to catch a glimpse of rural life. As we left the sprawling city we passed mountains covered in tropical vegetation, farmland and typical wooden Malaysian homes built on stilts and painted in all different colours. All was going well until the conductor informed us that the railway station is a long way from Melaka. An hour it turns out. And an expensive hour in a rickety old taxi. 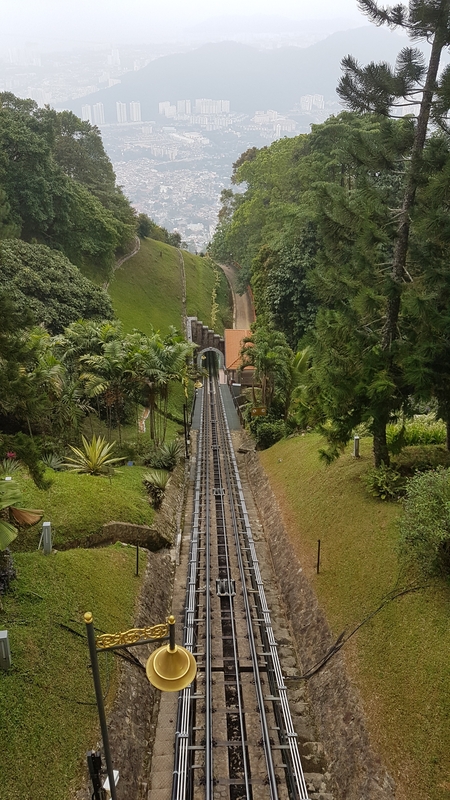 The friendly 71 year old taxi driver who told us a lot about his life – 3 wives, 10 daughters, numerous grandchildren and his pilgrimage to Mecca – suggested we should get the bus to KL on our return leg (but we ended up taking an uber to the station instead). We had two nights in Melaka. We were staying in Chinatown, right in the heart of the old town. We arrived on a Thursday and many shops and restaurants were closing by 5pm. It was very quiet and pleasant to wander around the narrow streets and picturesque riverfront. We randomly came across a group of locals feeding some tortoises and an on-location film crew filming. 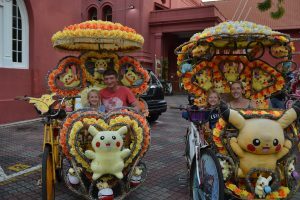 It was a huge contrast to the following night where the main road – Jonker Street – becomes a night market heaving with tourists, street food and stalls selling mostly tat! 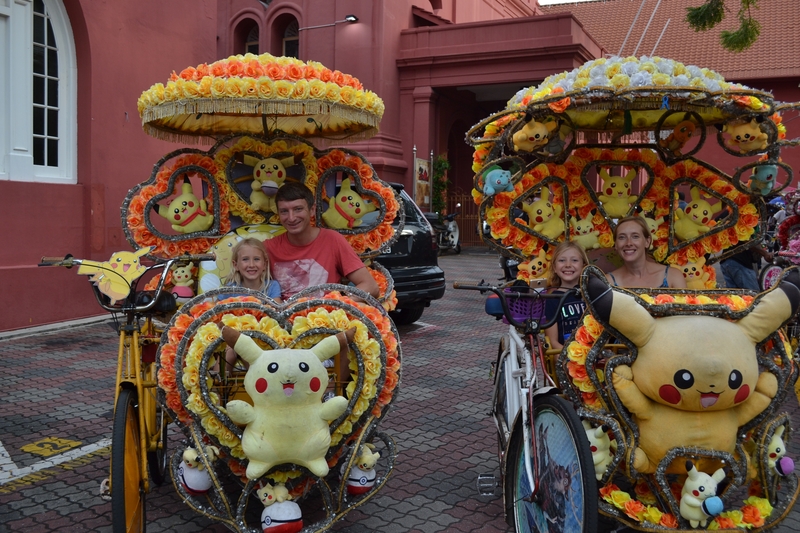 During our travels we have seen and been on our fair share of tuk tuks, rickshaws and cyclos and we had heard about Melaka’s elaborately decorated trishaws, but nothing prepared us for how outrageous they are! Hello Kitty, Frozen and Pokémon were popular themes. The girls chose a Pokémon one and we were treated(?!) to the theme tune playing very loudly as we began our ride! Had we waited until dark to take a tour we would have also enjoyed it in its flashing light glory! The following day we took a boat trip, where we saw more of the lovely shophouses along the river’s edge, many of which have been restored and have colourful murals painted on them. We spotted lots of water monitor lizards and passed Kampung Morten, an original Malaysian style village built in the 1920s which is now protected by the government to preserve its character. If we had more time we would have visited the village. We walked up to the old Dutch and Portuguese forts and visited an old shop house which is now a ‘museum’ to demonstrate what a traditional shop house would have looked like inside and out. Built in terraced rows the narrow but long property would have an area where merchandise would be sold at the front, a workshop behind, with a courtyard and kitchen at the back, and living quarters upstairs. Continuing our exploration of food we tried Chinese chicken rice balls, Nyonya curry and popiah – soft spring rolls – all delicious. However we weren’t quite so keen on neither the frozen dessert, cendol, with sweet corn and beans nor the very smelly fruit, durian, that we have heard so much about! The train from Melaka to Butterworth station in Penang took around 6hrs and then we caught a ferry to George Town. Penang is often described as ‘the pearl of the orient’ and it lived up to it’s reputation. An eclectic assortment of architectural styles – grand colonial buildings, narrow streets lined with shop houses, huge perenakan mansions, mosques, churches and temples. It was a pleasure to just wander and take it all in. The children particularly enjoyed a street art ‘treasure hunt’, practising their map reading skills to find their favourite murals. 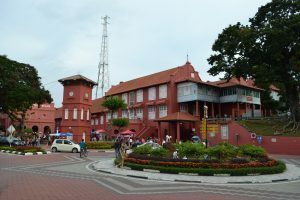 Walking through little India was a feast for the senses – bright colours, bollywood-style music playing and the smell of spices was a highlight for me. 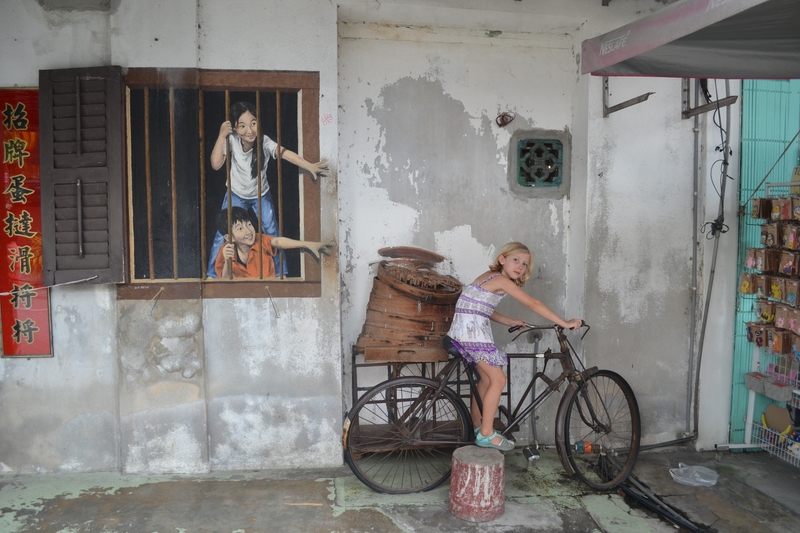 A city of contrasts, we visited a Baba Nyonya mansion, filled with beautiful furnishings and treasures, and the clan jetties, primitive wooden huts on stilts over the sea in the harbour originally built to house Chinese labourers. We ate at a typical Malaysian hawker (street food) centre where you can find anything from Chinese to Indian to Perenakan in a one-stop-shop. 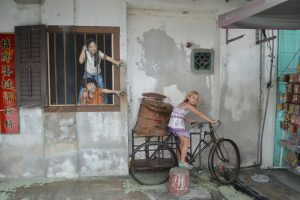 Click here to see more of our Melaka and Penang photos.